Today, Allison and I had a great day outside with the horses! We played with all the horses and I had Allison sit on Eddie while I played with him a little bit, because he was quite snarky when I tried to get on him. I played with Eddie with some more backwards circling game and it's just getting better and better! I love playing with him, there is always something to do and he never cease to amaze me! I love you Eddie! I think I might also send in a video to Mr. David Lichman through his Hitching Post video coaching system. I'll just ride Eddie and do some things that we can do and things we can't do, and send it in and see what he says. We could use some help with our Freestyle. But I'm super content with where we are and we're having fun, and that's all that matters! Anyway, here are some pictures from today!! Today was just a blast! First I played with Diesel! We went for a walk through all of our pine trees and grazed for a good 45 minutes. We went for another walk through the back yard and through the trees. He was so cute, and so silly! We trotted around for a little bit and went for a nice trail walk. :) I think I might take him for a walk down to the creek across the road. I think he would have fun with that. He loves trail walks! Eddie and I went out to the pasture and we played with a bunch of stuff. We did a lot of circling game and we started something new! I asked him to back up a half a circle with me just standing still in the middle. He did it!!! I was so happy!!!! And so proud of him! He had a bit of a hard time figuring it out, but he got it, and it looks like once we do the pattern for a while he will get it. We also did something that was in the February Savvy Times. I asked him to put one foot at a time over the log. He did it!!! He never ceases to amaze me!!! I made a ton of videos from the footage I took today. So I'll have the video at the bottom of the post. Scout and I played out in the pasture and out in the track. First we did some fun circles and some sideways from zone 1. We rolled a few times, ;) and then played with a log. His circles were really, really good and he hardly broke gait. We did some zone 5 driving and some friendly game and sideways and circling from zone 5. He did great, and he is getting more confident with it every day! He had an accident when my sister was driving him once, and that seemed to really spook him. So I'm slowly re-introducing it to him. And he's doing REALLY well! Fun, fun, fun in the snow!! Today was great! I got to play with our whole herd! Next it was Eddie's turn! 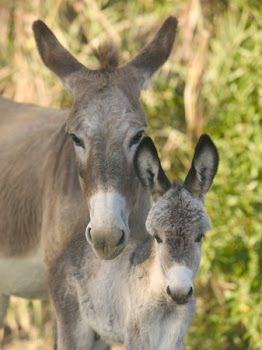 We went out and played in the pasture. He was pretty sleepy, so we didn't do a lot of running around and plus the ice was there. So, I would send him out on the circle and he would go almost to the end of it. We were probably at 35-40 feet the whole time. That was at a walk too, and the line was dragging the whole time. Almost to the point where I had to take in 5 coils because he wanted to stay in with me the whole time. We jumped the tube and few times because it's in this huge drift. This thing (the tube) that used to be up to my knees, is right in the middle of my shin. That's how big the drift is. So there is no chance of hitting the ice that is underneath. But still, it feels like I have to walk on eggshells and whenever he jumps into a fast trot, I have to slow him down. But on the track we can rip!! We went out there and ran around because he had quite woken up. So we ran about 600 feet and I was at a sprint, in huge winter boots, in 5 inches of snow. Needless to say, I think we're both tired! So I was sprinting and he was doing his magnificent extended trot. I LOVE that trot! I can't wait until I can ride it!!!!!!!!!!!!!!!!!! It was really cool, at one moment we were both right next to each other and our feet were exactly in unison. It was SO SO SO SO SO pretty!!! I wish I had had a camera, but it was an amazing experience. I just love that moment when you're both thinking the same thing and your horse is just SO connected. Only a few times we've expierenced that. Once when we cantered a ton out in the pasture, this time, and one afternoon in the summer when we had a Level 4+ liberty session. Hooray for excellent play sessions! Here are a few pictures from yesterday! Eddie and I have been playing with some fun stuff. Mostly being out on the 22 foot line and keeping the connection. We finally got to play in the pasture today, but just at a walk, because there is still ice underfoot. I took Scout out for a while today too and we played for quite a while. We did some zone 5 driving and played with our yoyos. We kept them really straight and they looked amazing!! I did the same with Eddie too, we played with yoyos. I asked him to jump over the tube, and then back up to it, keeping it straight. He did really good! He was only a little crooked. Hooray for pony play days! On to Tuesday! Goodbye Monday! Yesterday we took all the horses out the track and the long piece we had sectioned off and just let them rip! First it was Diesel and he just trotted around/cantered a little bit and didn't do much. But then we let Eddie out and he was really having a good time. He was jumping and bucking and rearing and was generally having a good time. A few times he really dug in and just ran like crazy. It must have felt really good to be able to get all his energy out. We let Scout loose next while Diesel and Eddie were on a line. Scout ran around quite a bit and really did some big 'pony express' runs. He even got to hyper, that he jumped over an upright barrel (which was out fence that we had put up to stop them from going to the ice.) So he jumped the barrels and just took off in the track. He eventually stopped in one of the corners that didn't have any ice, thank goodness. We got everyone settled down and went back inside. They were so happy for the movement and exercise. Today Mom and I had a lot of fun with the horses. We took everyone out to the track to have some run around time and just Diesel trotted around a little bit. We let them eat some snow, graze a little bit, trot around and just have some exercise. 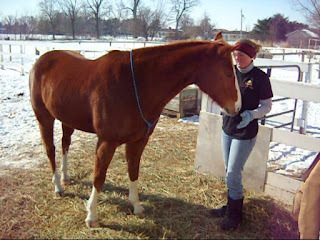 Then I played with Eddie for a while out in the pasture where there wasn't any ice. Man, we have never had a winter like this where we just cannot play. There is ice everywhere! At least things are melting off and hopefully in a month we'll be able to get out and actually do some playing. My mom played with Scout for a little bit and just generally gave them some time outside. I played with Diesel after mom played with Scout and he was just being so silly! Still no change since yesterday. He's still a silly little bugger. hehe! I did his feet too and trimmed them up. They are just so tiny! I love doing them! Although you do have to bend over quite a bit. :) But he stand pretty good and lets me do that. Now we're off to lock them up for the night and give them lots of hay that we sorted. What a busy, but fun day! “Therefore you shall love the LORD your God, and keep His charge, His statutes, His judgments, and His commandments always. Yesterday was so busy and so fun! 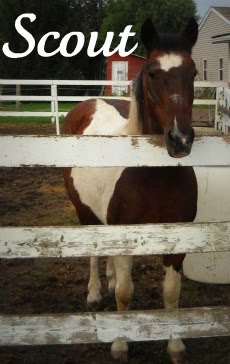 I played with Eddie twice, Scout once, Diesel once, groomed them all, Diesel got out and did a lot of chores with Dad. So I was very tired by the end of the day and spent the night watching American Idol & the Olympics to pass the time. ;) hehe! But anyway, Eddie did so amazing and so did Scout! In the morning I played with Eddie with some bowing and we played again in the afternoon out on the track. We played with some circles, weave, cavaletties and lots of other stuff. I grabbed the 4 cones that I was using for our weave, and put them together so Eddie would have to trot over them like cavaletties. He did super at that and he was really, really stretching into it. I think it must have felt good to use his back. I played with Diesel in the morning too. We played with the 7 games and just using his brain. My mom and I were talking, and we're going to send in a video of me playing with him to Mr. David Lichman. Because he has a system where you pay him what the advice was worth and it's over the internet with videos and such. We're just finding it hard to connect with him. Eddie and Scout they look to us to ask "Oh! What are we doing next?" But Diesel wants nothing to do with our 'stupid games.' He challenges me - a LOT! I feel like a Level 1 student all over again because he is just SO SO SO smart! It will be interesting to see what Mr. Lichman says. I'm sure it will be amazing advice from a 5* instructor. I heard my Dad yell, "Diesel's loose!" and I just automatically went, "Oh BOY!" So Scout cantered while I sprinted to the round pen where Diesel was. I got the fence down to the track and he just went right into the track and started to roll. Silly hinny!!!!!! It was funny though, he looked just like a little oreo milkshake because he just covered in the thawing mud. ;) I just had to chuckle. We got him back into his pen after moving Eddie and Scout around and then Scout and I just went back to grazing beneath the trees by the track. I was also thinking about Eddie's and my 'tricks.' I refer to laying down, bowing and spanish walking. I came to a realization today that once it doesn't become fun, or it becomes too much of a challenge, then you have to stop doing it. I noticed I started saying, "Let's work on our bowing." Instead of, "Let's play with our bowing." Yesterday I also noticed that Eddie didn't look like he was having fun. So, instead of 'working' on our 'tricks' we're going to start to play with our riding more. All those tricks look cool, but it's not for the benefit of the the horse. 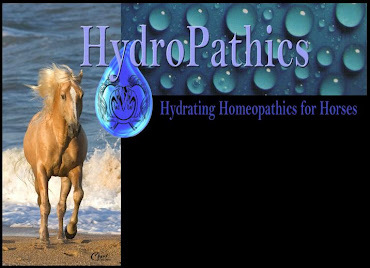 Lately, I've really taken up the concept, "What's right for the horse?" It's not fair to do what we want and forget about the horse's dignity. And sadly, I think some Level 4 students fall into that. There's a fine line between tricks and relationship. I've decided to play with our riding every day now and not get caught up on things that could trip us up. Well for the past few days I've taken up the role of barn manager. My sister is in St. Louis with her college horticulture program and my has had to work these past few days. My dad has all these days off though, so it's just me and him and the horses! Yesterday I played with Eddie and his bowing, playing out in the track and I groomed all the horses. :) Eddie did really, really good out on the track. He was a little spooky because it was windy, but after he got out some of his jumping around and some of his energy, he was as happy as could be! He did some excellent circles and we played with our sideways some more. We also did some weave and he was really, very light with it! When we played with our bowing, he did great too. Here's a video of it! He almost layed down a few times, and maybe today we'll be able to get it. It just keeps getting better and better! I'm hoping to play with Scout, Diesel and Eddie today. So that should be fun! Diesel and I are going to play with our bowing too. By special request from mom. ;) I will upload more video later! Today was really fun. I got to play with all the ponies and every one with something different! It's funny, the weather was the same too, it was sunny and warm without any breeze, then cloudy and cold with a strong wind, then snowing with a little bit of a breeze and it went back and forth several times! What silly weather we have! Anyway, I played with Eddie first because he was super duper playful. We trotting around everywhere out in the track and then Diesel started to run around. So that spooked Eddie quite a bit, so we played with some squeeze game with a barrel to get his mind involved. Once we did that, he was fine! So we played with some weave and then some trotting circles with the bullseye pattern. It was really fun and he did great once his mind was in the right place. :) We ended with some grooming and itches and went back up to the barn. He was super light though. Every time I asked him to do something, I was always working on my lightness. It really paid off and he was very engaged! Oh yeah! We played at liberty for a little bit after that too. Even though we haven't played with it for a while, he was great and it only took a few minutes to get him interested in me and wanting to do things together. At first he had a bit of a hard time drawing towards me, but I just waited for a connection and he came right over. We did some cutting game, close circling game and stick to me. It was very fun! Then I played with Scout while it was sunny! We did some very light weave at the end of the 22 foot rope. He was very light, and VERY sleepy! So I took off the 22 foot rope and put on my 2 savvy string. We rode up and down the north line and watched my dad put up some fencing. He was so warm and SO fuzzy! Although he's starting to shed, so that should be fun..... There was hair everywhere!!! Scout was even really light when I rode. All I would have to do is look where I wanted to go, I didn't use my legs or my reins at all. It's really cool, ever since I watched the Level 4 Finesse DVD from the Level 4 pack, I've been SO aware of things that I do that influence the horses. Especially when riding. So it's gone one level deeper. Woohoo, another level of understanding!! :) Yay! Then Scout really wanted to roll. He was going to roll with me on him, but I thought that I'd better get off. So I dismounted and I rolled and then he rolled too. It was so sweet! He did it twice and he looked so itchy. So I gave him some itches to end with and we went back into the paddocks after that. It was a really nice, really sweet time with him. I really can't wait to start playing with him more this spring and summer. He reallys teaches you a lot, especially how light you can be! Next was Diesel! My mom was playing with him and she wanted me to do the driving game with him so she could watch me. But we ended up getting some scratches instead and just chilling in the sun. He was falling asleep and so was my mom! It was so warm out and sunny out! In fact I had my coat off for Scout's and Diesel's play times. So that concluded our busy day off and now it's is snowing and looks like it will be for quite a while! I hope you're having a wonderful Sunday around the people you love. I know I am! Our family has been outside/inside and just enjoying the day together and looking forward to Giordano's pizza tonight with the figure skating on the Olympics. This morning we were all outside for a very long time. I took a ton of pictures just form everywhere and Eddie was SO sleepy! I was asking him to lay down and he almost did it! He was so, so, so close to laying down. I bet in a few more tries we could get it - but I don't want to rush. It may take 2 more weeks, it may take 2 more days, it may even take 2 more years, but we'll be ready, when we're ready. It's all God's plan anyway! We came inside after playing around outside, and we ate lunch, my parents took naps, we watched some cross country skiing on tv and then we went back out. He was so close to laying down in this picture! If he hadn't been so close to the fence, I think he would have. I love you so much Eddie!! So yeah, sideways was next and we played with sideways from zone 1 at the walk and at the trot. He was excellent and he was really engaged. We only trotted for a few steps, but it was our first time doing it in a while. We upped it even more and then did some trotting sideways towards and away. He was excellent both ways and both directions! Yippee! After that we did some circling game. We were on the 45, so I kept it coiled up and just asked him to do a few circles at the trot. Yet again, he was excellent and offered more than a few circles. When we got home, we took the horses out and we played with them. 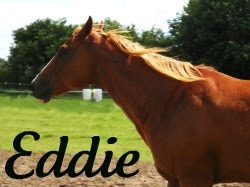 I got to ride Eddie for quite a while and we played with some backing up and just chilling in the sun. We went out to the track and played with some sideways everywhere. :) It was fun! Then today, Mike came out to trim the horses and I did Eddie's front feet while Mike watched. It went really well, I wasn't quite sure of what to take off with the hoof knife, because I don't like taking much off. But I got his bars down and did most of his frog, then I let Mike do his sole. It went really well. I need some better equipment - a better hoof knife, rasp and a hoof stand, but those are things that I can acquire steadily. So, after Mike left and he did his back feet while I watched, I took Eddie out and we played for an hour or so. His sideways is GREAT now. I grabbed the 45 because I needed something light, and we did some long distance sideways and some circling game. He did great. I love you Eddie, so much! It was a really great couple days and we've gotten to play every day this week. Yippeee!! Oh, plus I get to check something off in my "To Accomplish in 2010!" Today Eddie and I had a great play session! It started out with just going to take his blanket off, but turned into a 2 hour play time! It was freezing this morning 0 to be exact, but once the sun came up, it was around 20-30. So that was nice to play in! We started with going for a walk around the trees in the backyard. Then after we grazed for a nice long time, we went in the track and trotted around in there. There is hardly any ice and what ice there is, it's all buried deep in the 8 inches of snow. So we plowed through all the snow and made some tracks to do some circles. Then, after doing some circles, that he did excellently, we went to sideways! They were some of his best! He trotted sideways away for about, oh 20 feet. Then he walked sideways towards very lightly. All I had to do was walk backwards to ask him to come sideways. And he did it so willingly! Next we went for a lap on the track, trotting here and there and then we stopped on one end and played with our bowing. I didn't have any treats to entice him with, but he did it once without any treats. So that was great! Oh, but guess what?! It made me so happy! I got on by just swinging up there with the help of a half barrel and just sat there in the sun and we played with something he was having trouble with. Backing up! Yes, he was having some trouble backing up. When I would ask him to, he would plow through the pressure and just go to wherever he wanted to go. So I would bend him to a stop and one time he didn't even stop then, so I hopped off and firmly corrected him. But after that he was great! He was so light and I could see him thinking, "Oh, ok! Sure mom!" So that was much, much better. Then we played with some indirect and direct rein and ended with some barrel licking in the sun. It was so nice to ride. I absolutly love riding in the winter! Hopefully in the next couple of days, or this weekend, Allison and I will be able to go for a trail ride in the track. That would be fun! Well we all just got back inside from a nice, long walk with the horses! Dad, Allison and I all went for a walk behind the pine trees! It was very fun to be able to play in the new snow! We got over 8 inches and in some spots, I wouldn't be surprised if it was over 1 foot. We had a lot of fun! There was a barrel behind the tree grove and Eddie and I played with that a little bit. We sidewaysed over it and licked it. ;) I also asked him to jump over it and he did it so willingly. He also liked eating the birdseed out of the bird feeder! :) Yummm... sunflower seeds, millit, corn and other things! He makes me laugh! We did a few circles back behind the trees and then went for a long trot down the west side of the pasture. It was very nice to get out and play with the horses because we haven't been able to because of the snow storm. But now it's clear, the wind is letting up, and the temperatures are bearable. Hopefully we'll be able to go out for more walks this week. And maybe we'll even be able to play in the pasture/track because of all the snow we got! That would be great!!! with a few things that don't require so much energy or moving around. Anyway, savvy on my friends! And stay warm! I thought it would be nice to meet you all! You listen to my ramblings everyday, so maybe I can listen to yours too! So, please comment on this with your name, where you're from and your blog! I would love to follow your blogs and get to meet you all! 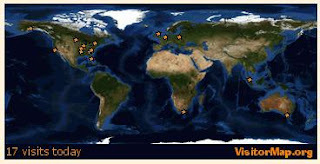 This is where I get to see who sees my blog day to day. So please, who are you on here? Thanks! I can't wait to hear from you all! This morning Eddie and I went on another walk! But this time I grabbed a barrel and we played all the games with that barrel. For the friendly game I had him push it, sniff it, lick it, roll it around and so on. Then we porcupined to it and yeilded away from it. We did the same with driving, we yoyo-ed back and forth to it and straddled it. Then we circled around it and through it, over it, around it and so on. We sidewaysed off of it, on to it, to it and over it. hehe! Then we squeezed over it (jumped it) from a standstill. Fun! I just watched the Level 4 Finesse DVD and it really made me think outside of the box when it comes to the 7 games. The 7 games are pretty much everything! 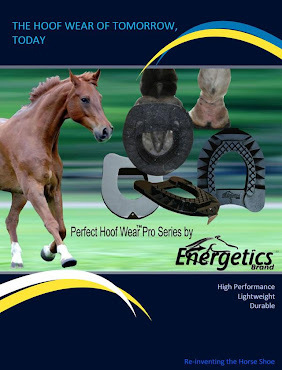 From wiggling the rope out in front of your horse when you're just beginning to doing slide stops, a piaffe, passage and the sideways game too! Shoulders in, haunches in, just going sideways towards and away. It's all the yoyo game and the sideways game! For all the other ones too. The possibilities are endless! The spanish walk that I have been teaching Eddie, that's a combination of the driving game and the squeeze game. Because he has to control his feet and mentally collect them while I use the driving game to ask him to pick them up. See?! What a fun journey this is! Always something new to learn!!! I wanted to make this post include something else, because we didn't do much of anything today. I've been thinking (which I do a lot) and there's something after Parelli that is greater than Parelli itself. I think someone summed it up well, Parelli is the best 'cake' (foundation) program there is. I mean THEE best! But once you form your relationship with your horse, there is nothing that you can't do! The relationship is the greatest thing that you develop with Parelli. It's not the 'ultimate sideways' or the 'best circles' it's a relationship that you can go to the highest heights with. Cloudy with a chance of...Riding? hehe, that was my phrase today! I got to ride again! I took Eddie out to the track and we did a lap online with lots and lots of trotting. We played with some more sideways and he was excellent. He was so light and responsive. We had a few interruptions when Diesel was trying to climb through the fence to the ice rink - I mean outdoor arena. So I had to put Eddie away and turn the fence on. 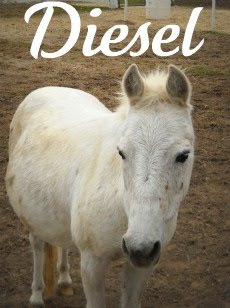 Yes, Diesel did get zapped, and that seemed to get him out of his hinny fit. Forget hissy fit, it's a hinny fit! I got Eddie back out and we went to graze underneath the trees. He was happy that he could graze and get back out of his paddock. A few of the kitties came to visit while I was grazing Eddie, so we played friendly game with the kitties as they sniffed noses and tried to get on Eddie's back. hehe! We went back out to the track and did some more barrel licking. ;) I hopped on and off and I finally just sat on him, yoyo-ed him away from the barrel and back towards the barrel with just the savvy string. He looks SO handsome with our clean, white savvy string! We ended by the gate and I hopped off and we went back inside. 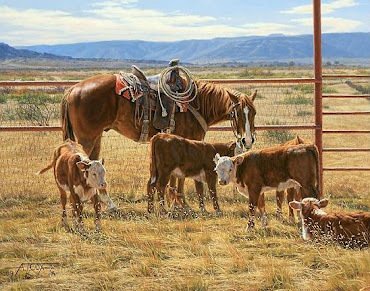 By that time Allison had come outside and she took Scout out to graze and play. So I took Diesel out and we trotted around and grazed. He was so cute! He liked to get some of his energy out by trotting around by the trees and the round pen. We went back inside the barn after that and i checked on Diesel's back feet to see if they needed to be trimmed, and they didn't. He has really strong, thick, healthy hoof wall that I didn't want to take off because there's nothing wrong with it and it's not long. So because I didn't need to do Diesel and I had my stuff all outside, I did Eddie's front feet. He was really, really good with them! I trimmed back his wall, exposed it, took off his bars and just did a general check. They look great. I'm so proud of how they look. And his crack that has been there since we got him? It's almost gone! Yippeee!!!! Sorry I didn't post this yesterday! Today Eddie and I had a great day! Just dad and I were home, so we did some school, and then we headed outside! Eddie and I first went out to the track and we did a lap playing with some games in the south and east lines. Then we grazed out by the round pen and spent some nice quality time together. It was SO sunny and he was so sleepy! So after we went back into the track I was watching him (actually I was watching him the whole time we were playing) and I thought, "This horse looks very very rideable!" So we grabbed a few barrels for point to point and I hopped on! We would walk/trot to different barrels and I was doing it with one rein that we hardly even used. I had a savvy string around his neck and just used that for direction. It was so cool! I really like riding with a savvy string instead of a carrot stick. It just seems easier to me and Eddie responds better with it. Anyway, I sat on him in the sun as he would lick barrels and then we would go to different barrels and lick those. It really blew my socks off that we were able to do that. If I had tried that 2 years - with hardly any play time, and with a month and a half cooped up in a small paddock. He did so well and it's times like these that I really realize that we have come a LONG way. Once my sister came home from school, we took all the horses for a walk in the track and he was very sleepy still. :) It was fun! We did two laps, grazed the horses under the trees and went back inside. It was a really fun day. I love you Eddie! And I can't wait to progress with our Level 3 freestyle this summer!!!! Here's a video of Eddie and I playing this afternoon. It's been snowing on and off all day, so we went out and played in it! It was very fun! Well it's the 2nd day of February! It is snowing this morning and looks like it will be done in a little bit. Yesterday we took the horses for multiple walks and I took Eddie around the track about times. He was very happy for the exercise! Regarding playing, we didn't do too much, just some games here and there and throwing in a few circles. We did play some major friendly game with a squeeze that he always has trouble with. He would always spook whenever he got out of it when his zone 5 was in the squeeze. So we backed into it, backed out of it and played with it until he got better and better and he didn't spook at all. Yippeee! Today mom and I are going to do some school, play with the horses and scrapbook some more. It should be fun! And we cleared out an area underneath one of our big trees so that we can play there and now that the snow is there, it should be even more fun! :) Here are some pictures from yesterday!